I received an advance copy of this book for review. This does not impact the content of my review. Wow. Just. Wow. Sadie is an overwhelmingly dark and intense novel. 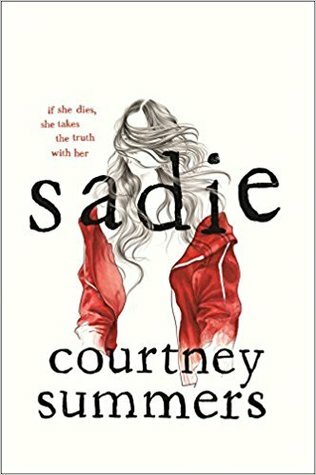 Sadie is not a book I would normally pick up. I prefer happy reads. I prefer lighter stories. Sadie is determined to find and kill the man who killed her sister. She’s on a one-way road trip to track him down. She’s angry. She’s hurt. She won’t stop until she gets justice. Or is it revenge? I could not put this book down. It consumed my thoughts whenever I had to take a break from reading it. Be warned, there are a lot of potential trigger warnings in this book, including addiction, physical and sexual assault, pedophilia and child abuse. The content is not graphic in nature, but is disturbing at points. One of the best books of 2018. A riveting read. Told in alternating formats, the novel allows the reader to both follow along beside Sadie on her hunt and join the ranks of the listeners to the podcast The Girls as its host interviews the people Sadie came across to try and figure out what happened to her. Between the prose of Sadie’s side of the story and the podcast transcript, the story takes shape and reveals more and more painful moments. Courtney Summers knows just when to stop a chapter to create the most gripping moment and make you unable to stop reading. I’ve never read Courtney Summers before. After this, I will likely read her again. Sadie moves so fast. It is a brilliantly woven story of love, hurt and the quest for justice. You can actually listen to The Girls podcast based on this novel. Listen to a preview at courtneysummers.ca. Then subscribe on your preferred podcast platform of choice.